At a time when schisms dominate political headlines, the president of the California State Senate joined environmental experts at Pitzer College’s Air Quality in Southern California Summit on October 6 to speak about a common cause in the Golden State: the air we breathe. The summit came at a critical time, said Brinda Sarathy, director of Pitzer’s Robert Redford Conservancy for Southern California Sustainability, which organized the event. During a year that is on track to be the hottest in recorded history, the meeting of minds was held in the suburbs of Los Angeles—an urban area plagued by the worst ozone pollution in the US. The summit came a year after the onset of the Porter Ranch gas leak, which The New York Times called the most disastrous gas leak in American history, and eight months after California Governor Jerry Brown proposed a plan to spend $176.6 million to test and clean up lead-contaminated homes around the now-shuttered Exide plant in Vernon. The summit included an all-star panel featuring Joseph Lyou, president of the Coalition for Clean Air and a board member of the South Coast Air Quality Management District (SCAQMD); Timothy O’Connor, director of the Environmental Defense Fund’s Oil and Gas Program in California; and Nancy Martinez, a reporter with Eastern Group Publications. Along with de León, they explored a raft of interconnected issues, ranging from particulate matter to political matters. “In California, we burn about 20 billion gallons of gasoline and diesel fuel a year, which means that we’re sending about $50 billion outside of our state every single year,” O’Connor said. Lyou stressed that contaminated air “is not an equal opportunity pollutant.” Not only are some individuals more vulnerable than others to the health effects of pollution, entire communities are disparately impacted by environmental contamination, he said. “Unfortunately, it’s highly correlated with your income and ethnicity,” Lyou said. 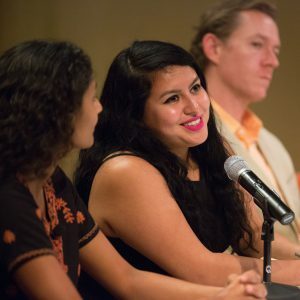 Martinez, who has covered the toxic contamination caused by Exide Technologies battery recycling plant in Vernon, CA, outlined what she called the double standard between affluent neighborhoods and predominately working-class and minority communities in California. She compared the reaction to Porter Ranch, where last year’s massive gas leak elicited a relatively rapid response by government officials, to the Exide plant, which exposed residents in surrounding communities to toxic levels of lead and arsenic for decades.